From Tuesday Studio Mysercough will be in residence in the Discovery Pavilion. Studio Myerscough have created the structure which acts as a billboard for the entire Discovery Programme. Situated in the Library foyer, The Pavilion will house an 18-week rolling programme of creative residencies focused around the theme of Discovery. 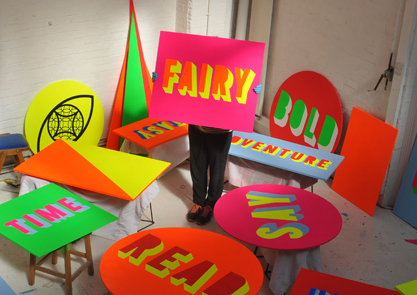 Morag Myerscough is an award winning artist, founder of Studio Myerscough and member of the creative collective Supergroup. Often referred to as a ‘place- maker’ she has produced an eclectic — and sometimes eccentric — body of work that is frequently unclassifiable but always engaging. Morag & Luke were the exhibition designers for Home of Metal at Birmingham Museum & Art Gallery. 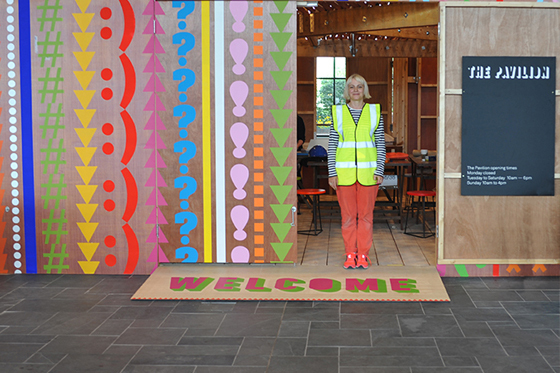 For The Pavilion, Morag worked with fellow Supergroup member artist Luke Morgan to create an upbeat and stimulating surrounding for the residents. Entirely hand–crafted and hand-painted The Pavilion is a bold and engaging structure reflecting the diverse, and often radical, offerings of the Discovery Season. During the residency participants will have the opportunity to have a go at some of Morag’s design techniques and stencil some of the bespoke furniture for the space. Not to be missed, she is a truly inspirational artist.